Unpacking and repacking a bag every day for months teaches your hands how things fit together in a way deeper than can be described with words. I’ve learned packing origami: what used to take 20 liters now takes 15. I store all my medications in one bottle, snap the handle of my new toothbrushes in half, and carry a bar of soap that I shave into smaller pieces with a credit card instead of paying more for body wash or sticking a wet bar of soap back in my bag. These things seem a bit crazy, but when you’re forced to repack a bag 180 times you’ll start finding your own optimizations. My Synapse 19 (review) holds and keeps everything I own — today about 19 liters — and also works well as a day bag. Not everyone wants to travel with 19 liters, but Tynan and Allison Levine use the Synapse 19 and also love it. My Synapse 19 during the sunrise hike up Mt. Bromo, Indonesia. Travelers become obsessed with their bags. It’s because it’s hard to make a good bag. If you use a bag long enough you’ll realize it’s shortcomings, and you’ll realize what makes a good bag great. A good bag keeps things safe from rain, theft and drops. A good bag keeps things organized and at hand and is comfortable to carry all day. 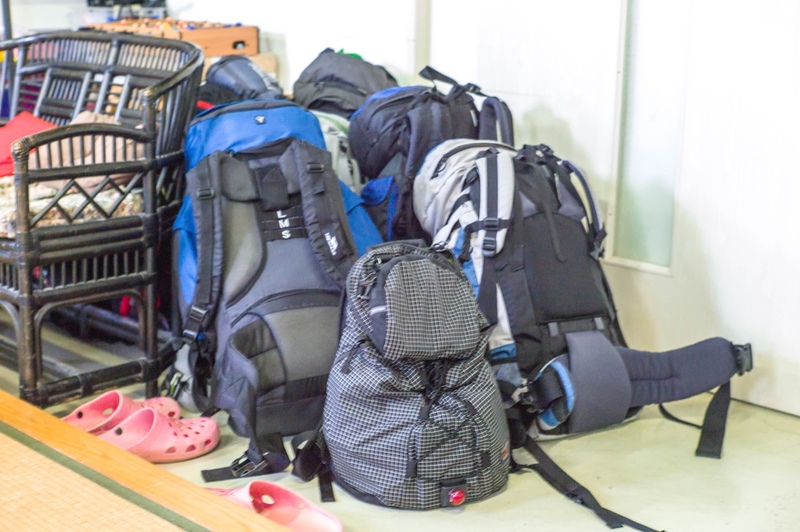 As you move throughout a trip you’ll pack, unpack, and carry your bag hundreds of times. You’ll become painfully any of every bag’s shortcomings. You’ll realize that the perfect bag is an almost impossible thing to find. Thankfully for pedants like me, there are good bags out there. How do you pick a bag for travel? I’ve been on the road full time for six months and have thought about this a lot. Not everyone is going to want to travel as light as I do, but I know the tradeoffs of different bag sizes and can talk about them knowledgeably. When I travelled in college my bag was 60 liters, later it shrank to 45, then 26, and now 19 liters. My kit — what goes in the bag today — is what I need day every day plus emergency gear until I can pick up extra supplies. If something is not used for more than a week it generally gets out of my pack. I’ve learned that what I can do is affected by what I do and don’t carry. If I bring comfortable shoes I’m more likely to walk, if I bring a laptop I’m more likely to write. But if I bring a heavier bag I’m more likely to get tired and want to sit, and if I don’t bring something I usually forget that it ever existed. How much I carry has a big impact on my lifestyle on the road. The biggest choice you have to make when picking a backpack is how big your bag should be. So I’ve laid out some observations from using different pack sizes and also seeing people struggle to carry them around. 5-10 liters: Optimum travel weight and easily doable. Just a change of clothes, a rain jacket and smart phone (see my suggestions here). Everything else can be purchased en-route and discarded or given away when you’re done with it. You’ll have to cycle through gear more often than someone with a larger bag. This turns out to not be so expensive: you’ve saved money by buying less gear up front. You’ll also save money by nevering paying to check a bag, to hire a taxi to go less than 2 miles, or by overpaying for a hotel you find online. In these volume limits you don’t need much internal organization. At exactly 10 liters a roll top dry bag would be a solid choice. The bag is cheap, durable, and waterproof. Good backpack options are the Tom Bihn Daylight and the Sea to Summit Ultrasil. Technically both of these are over 10 liters, but they lack any internal organization and will collapse to a very small size when you wear them. 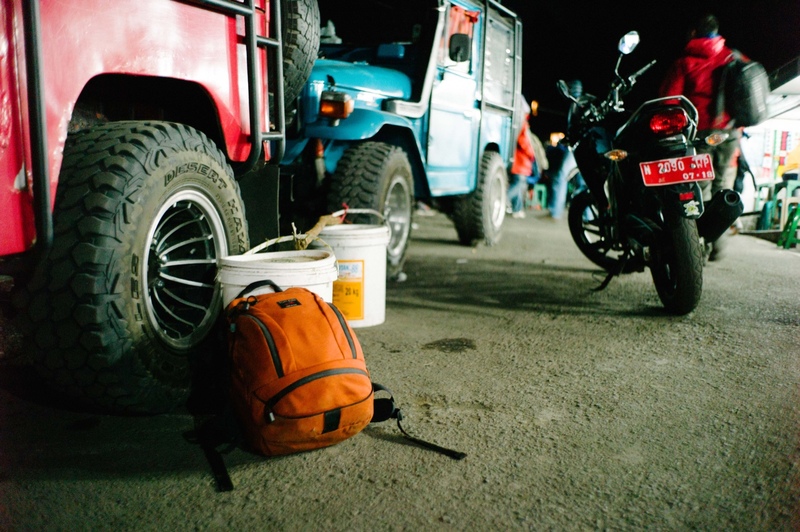 10-20 liters: Bigger but still comfortable enough to carry all day. You’d rather have a lighter bag but it’s not a big deal to go hit sights with it. You’ll never need to pay for a storage locker. This is the ideal travel size if you want to have a few more situations covered (such as carrying both a warm jacket and a rain jacket) or carrying a camera and a laptop. This is where I fall. My favorite bag in this range is the Synapse 19 (review and details here). An overloaded Synapse 19 backpack. I carry less than this now, but every time I leave the United States I end up with an overpacked bag. 25-30 liters: Bags this size will will be lighter and smaller than almost everyone else’s bag but still big enough to be unpleasant to have with you every hour of every day. You’ll probably want a separate day bag to hold valuables when you need to leave the bigger bag at a hotel. My favorite bag in this range is the Tom Bihn Smart Alec. The Smart Alec is one of Tom Bihn’s only bags with a built in compression system to become smaller when it’s empty. It’s the pack I started my trip with in March. It has some benefits over the smaller Synapse 19. The 19 encourages you to pack weight in the organizational pockets away from your body. This makes the bag feel heavier than it needs to. In the Smart Alec the whole bag is an open space and you can decide where to place items and see how they make the bag feel heavier or lighter. Another option in this range is the Aeronaut 30. I haven’t tried the Aeronaut 30, but I have tried the Aeronaut 45. The Aeronaut design is nice if you want something laid out like a traditional suitcase, but I personally would not want to use it as a daily backpack. It has backpack straps and works nicely for carrying things around, but organization isn’t laid out in a way makes it the kind of bag you’d want on your back every minute of every day. 35-45 liters: If you really need to carry a lot 35-45 liters will do. But this amount of volume and weight isn’t comfortable to carry all day. 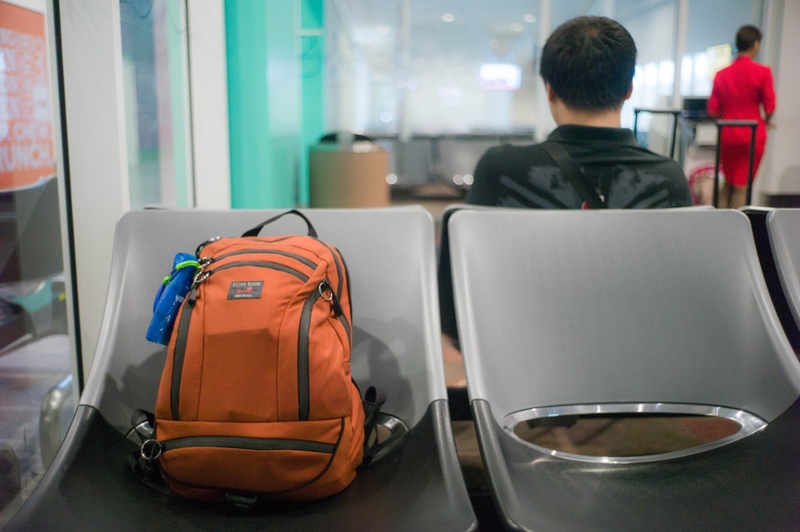 These bags are big enough that it will often have to be checked on flights outside the United States or manhandled by transit staff on boats and buses in Asia. When I carry bags this big I fantasize about getting it off my back as soon as possible, which means I often travel from hotel to hotel and as a result lose spontaneity from my travels. I can’t see myself getting off a train with a 45 liter backpack and wandering a city by choice for the whole day before finding a hotel sometime after dinner. To me that’s a deal breaker: big bags make travel less enjoyable. If you do travel with a 45 liter pack you’ll probably want to include a day pack in your gear as well. Good options would be a roll top dry bag or the Sea to Summit Ultrasil. You’ll use the daypack to hold valuables when your bag is checked for flights or stored in the bottom of a bus or a boat. At 30 liters or smaller, few people question the size of a bag as you board transit. At 45 liters it becomes very hard to keep the bag on your person at all times. My original around the world bag, a Smart Alec 26, next to typical packs you’ll see on the road. The Smart Alec used to feel small to me, now I can’t imagine going back to a bag that big. The 45 liter bags are just insane unless you need to carry extra clothes for business or social functions. Greater than 45+ liters: The bag generally extends above your shoulders when walking around. You’ll want to put it down as soon as possible. When I travelled with bags this big I had to plan my moves between hotels and plan my days around going back to a hotel to get the bag and then dropping it in the new location as soon as possible. As a side effect I wanted to arrange lodging before I arrived in a town, leading me to overpay vs finding deals in the street. 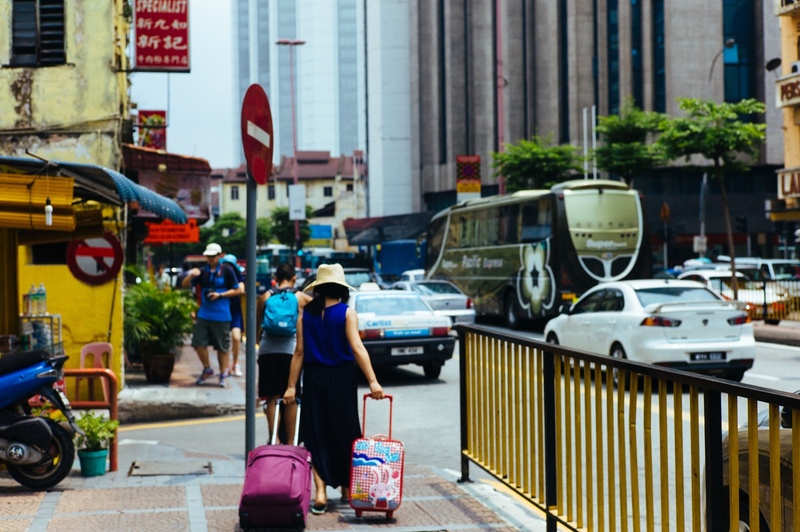 Two suitcases in Kuala Lumpur. I’m glad this isn’t me. Unless you deeply need the extra clothes try to stick to a smaller single bag approach. As I’ve tried to write above: the size of the bag you pick has a big impact on your travel. Probably more than any piece of gear since the bag you pick determines how much hassle you’ll run into moving yourself from town to town. As I’ve cut my pack down in size over time I’ve realized that I don’t really miss much. The only thing I’d like is a full size tripod that collapses into nothing. I’ll be shopping for one in Japan next week.